How do you guarantee that a Justice League movie adaptation will rake in tons of cash at the box office? You hire the people behind The Dark Knight Rises and Man of Steel. Ever since Marvel Studios set the box office on fire with last summer's massive blockbuster hit The Avengers, Warner Bros. has been working to create its own superhero team movie based on DC Comics' Justice League. If you're unfamiliar with the team, the League would be a group generally consisting of Superman, Batman, Wonder Woman, Green Lantern, The Flash and that dude who thinks chatting with halibut is a super power. Even pared down from the much larger comic book roster, that's still a lot of heroes to gather in a single film, and as such it comes as little surprise that the WB's efforts to date have almost all been false starts. Seemingly tiring of not making tons of money, Warner Bros. execs have decided to go all out on the project, and to ensure that this thing gets made right, they've hired The Dark Knight director Christopher Nolan to oversee the film. 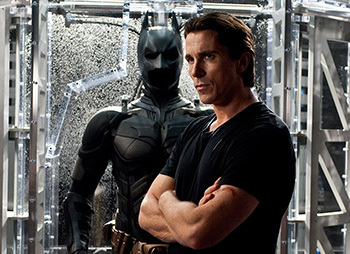 That alone should be reason enough for comic book geeks to wet themselves with glee, but more crucially, Nolan's involvement with the project means that Christian Bale, the world's current favorite cinematic Batman, will almost definitely reprise his role as the Dark Knight in Justice League. Oh, but that's not all. According to Latino Review, the WB is also quite fond of Zach Snyder's upcoming Man of Steel, and are attempting to bring Snyder on board the project as well. As with the aforementioned Nolan/Bale news, this means that Justice League's Superman will almost definitely be portrayed by British actor Henry Cavill. Cavill's IMDB listing does little by itself to indicate why this should be exciting, but all reports coming from the WB claim that Man of Steel is not just a good Superman film, it's likely to be the big movie of this upcoming summer movie season. Rounding out this revelation is word that screenwriter David Goyer is very likely attached to write the script for Justice League. Though you may not recognize his name immediately, Goyer is one of Hollywood's most experienced scribes when it comes to penning good superhero films. IMDB counts Nolan's Batman trilogy, as well as Man of Steel, Blade II and the surprisingly excellent Blade TV series among his past projects. Granted, Goyer has a few stinkers on his resume, but in most cases the failure of those films had little to do with Goyer's writing talents (see Nick Cage's manic overacting in Ghost Rider: Spirit of Vengeance). Now before you rush off to your social networking client of choice to share this exciting news with all of your geek pals, there are a few caveats to this situation you should be aware of. First, this is technically a rumor. We have no reason to doubt Latino Review as the site is exceedingly on point with information on upcoming superhero movies, but it does currently lack any sort of official confirmation or denial. That said, it should be pointed out that the WB normally jumps all over itself to deny information like this when it's false, yet the company has remained mum on the subject since Latino Review first published its story. The second caveat should apply to all pre-release information on any film project, but it bears repeating: As Justice League won't hit theaters for years to come, it's quite possible that all of this information could change by the time the movie starts shooting. Why or how that might happen remains a big, bright question mark, but it is a possibility that can't be ignored. Other than that though, it looks like Justice League will be the superhero film we'd all hoped Warner Bros. would make. When Bale claimed to be done with Batman, it seemed that whenever Justice League finally hit theaters it would be inherently crippled by a lesser Bruce Wayne, but now it appears that the movie has at least one strong leg to stand on. Expect more information to appear soon on which characters Warner Bros. will feature in the film beyond Batman and Superman -- the smart money lists Wonder Woman, Green Lantern and The Flash -- and who might play the antagonist in Justice League. Previous reports pegged Darkseid as the film's big bad, but that would directly ape Thanos' appearance in the upcoming Avengers 2, and if nothing else Christopher Nolan hates the idea of seeming derivative. Given that, it's likely he'd choose a lesser known villain, though who that might be is entirely up in the air. Personally, I've got my fingers crossed for Mr. Mxyzptlk. Not only because he'd be an interesting villain, but because I'd love to see Bale attempt to pronounce that name via his trademark guttural, "panther with a throat infection" Batman voice. That seems worth the price of admission alone.